Jordan Fisher Smith’s “Engineering Eden” is a vivid account of conflicts within the National Park Service over managing bears and other wild animals — conflicts that contributed to tragic results. Smith discusses his book Wednesday, Aug. 17, at Seattle’s Elliott Bay Book Co.
Wallace Stegner is famed for saying “National parks are the best idea we ever had.” They are a great idea, but that doesn’t mean that the National Park Service (NPS) has matched the ideals. Perhaps nowhere is this better illustrated than in how the NPS has managed the animals that live in parks, particularly its bears. For decades, tourists visiting parks such as Yellowstone and Yosemite could watch “bear shows,” where food was placed on platforms, and bears — grizzly and black — would show up to feed. These feeding frenzies were bound to be bad for bears, who became addicted to human food, and for people, those who came to watch and those who came to the park and were in the wrong place at the wrong time. Throughout the 1960s and 1970s the NPS regularly had to kill problem bears. People also suffered with numerous attacks and deaths. Unfortunately for humans and beasts, the NPS and wildlife biologists could not agree on what to do. The disagreement revolved around the fundamental nature of the Park Service. How should it manage its lands, with a dual mandate of preservation and creating places that people can enjoy? Many books and articles have attempted to address this issue. 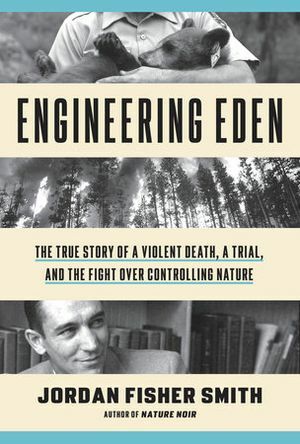 The latest, and certainly not the last in this centenary of the establishment of the National Park Service, is Jordan Fisher Smith’s “Engineering Eden: The True Story of a Violent Death, A Trial, and the Fight Over Controlling Nature” (Crown, 370 pp., $28). The author of “Engineering Eden” will appear at 7 p.m. Wednesday, Aug. 17, at Seattle’s Elliott Bay Book Co., 1521 10th Ave.; free (206-624-6600 or elliottbaybook.com). Although tragic and illustrative of the dynamics of the NPS mandate, Walker’s death and law case are not as interesting as Smith’s second narrative thread, the battle within the NPS. It involved legendary biologists with decades of field time studying the land and animals they loved and wanted to protect. Starker Leopold, son of Aldo Leopold, was the author of the seminal document on how the NPS managed wildlife. Beginning in the 1960s, brothers Frank and John Craighead had pioneered studies of the Yellowstone bears, including the first to use tracking collars. Adolph Murie, one of America’s first professional wildlife biologists, was long a proponent of letting nature operate without any human intervention. Each man was opinionated, passionate and stubborn, sometimes to the point where it stifled their effectiveness. They were not aided by the Park Service, which fares worst in Smith’s narrative. One Yellowstone superintendent objected to the Craigheads’ work because he thought it would harm visitors’ experiences of nature if they saw the bears’ brightly colored tracking collars. At the same time, the NPS continued to allow the feeding of bears, despite the objection of NPS biologists. One of the book’s many strong points is how Smith illustrates the conflict between the politics of upper-level management and NPS biologists, who come across as dedicated, smart and resourceful. In particular, David Graber deserves substantial credit for solving the bear/human problem when he invented the bear-proof food storage box found in national parks across the country. Combined with the development of backcountry bear canisters, the storage box, notes Smith, did more to solve the problem than any study or bear management change. For anyone who wants a better understanding of the conflicts inherent in the National Park Service, “Engineering Eden” is a timely and thoughtful book. For anyone who simply wants a well-written book, Smith’s book will draw you in with his passion, thoughtfulness and first-rate story telling. Seattle author David B. Williams is the author of “Too High and Too Steep: Reshaping Seattle’s Topography.” He blogs at geologywriter.com.